TACLOBAN CITY – Results of the 2015 Census of Population (POPCEN) showed that Eastern Visayas had a total occupied housing units of 975,625 as of August 1, 2015. This is an increase of 13.6% or 116,910 housing units over the 858,715 occupied housing units recorded during the 2010 Census of Population and Housing (CPH). This figure resulted to a ratio of 101 households for every 100 occupied housing units or 5 persons per occupied housing unit. Leyte (excluding Tacloban City) recorded the highest number of occupied housing units among the provinces with 402,126 housing units or 41.2% of the total housing units in the region. Samar ranked second with 162,886 occupied housing units, followed by Northern Samar with 124,909, Eastern Samar with 105,653 and Southern Leyte with 92,405. Biliran recorded the least number of occupied housing units posted at 38,105 (Figure 1). Tacloban City, the lone Highly Urbanized City (HUC) in the region, recorded a total of 49,541 occupied housing units. Single-type house was the most common type of building/house in Eastern Visayas. Ninety-four percent of the total occupied housing unit in Eastern Visayas reported this type of building/house. About 4.1% were duplex while 1.7% were multi-unit residential. Majority or 77.2% of the occupied housing units in the region had roofs made of galvanized iron/aluminum. Meanwhile, about three in ten (30.7%) of the occupied housing units in the region in 2015 had outer walls made of concrete/brick/stone. Of the total 985,418 households in 2015, almost half (46.6%) owned or amortized the house and lots that they occupied in 2015. A little over one-third (38.2%) of the households occupied houses which they owned but not the lots, they were rent-free with consent of the owner; 6.5% owned the houses but rented the lots that they occupied; 4.8% lived in rent-free house and lots with consent of the owner; 2.3% lived in rented house and lot; 1.5% lived in own house and rent-free lot without consent of the owner; and 0.2% lived in rent-free house and lot without consent of the owner. Majority or 83.9% of the 985,418 households in the region used electricity for lighting. Households that used kerosene for lighting accounted for 13.0. Solar lamps were used by about 1.6 percent of the households. Of the total 985,418 households in 2015, 31.5% used shared faucet community water system as main source of drinking water. The second highest reported source of drinking water was own use faucet community water system which accounted for 18.2% of the total households. The rest of the households used the following sources: shared tubed/piped deep well (16.2%); bottled water (13.5%); dug well (5.7%); protected spring (5.0%); own use tubed/piped deep well (3.0%); tubed/piped shallow well (2.7%); peddler (2.0%); unprotected spring (1.4%); lake, river, rain (0.8%); and others (0.1%). One-third or 33.1% of the households used shared faucet community water system as main source of water for cooking. The second highest reported source of water for cooking was own use faucet community water system which accounted for a quarter or 25.4% of the total households. The rest of the households used the following sources: shared tubed/piped deep well (17.9%); dug well (7.2%); own use tubed/piped deep well (4.5%); protected spring (4.4%); tubed/piped shallow well (3.2%); unprotected spring (1.3%); peddler (1.1%); bottled water (0.9%); and lake, river, rain (0.9%). QUEZON CITY – For setting the living standard of Filipino family to the lowest level, labor group Associated Labor Unions-Trade Union Congress of the Philippines (ALU-TUCP) is demanding that the government’s National Economic Development Authority (NEDA) retracts its statement and apologize in public for making out of touch declarations. Speaking before reporters Tuesday, NEDA Undersecretary Rosemarie Edillon said the living standard for a Filipino family of five is only P10,000 a month. Out of which only P3,834 are needed food or P127 a day alone. “We condemn this argument as inaccurate and a grave mistake. This is an affront to millions of poor Filipinos. We demand that the NEDA retract this out of touch statement and we are demanding that Undersecretary Edillon to apologize in public for insulting all of us with such a very low government standard of living and for taking the dignity of poor Filipino family to the lowest level,” said Alan Tanjusay, spokesperson of ALU-TUCP. Tanjusay said government should set the standard at a modest and acceptable level after reflecting the realities on the ground. “Government officials particularly the NEDA should immersed themselves in communities before they announce standards and policies. They should be immersed in public wet markets. They should often visit the talipapas and sari-sari stores not just depend on table studies if they want to know the real living conditions being experienced by Filipino families,” Tanjusay said. The living standard for a Filipino family of five should be P1,200 a day and P400-P600 a day of the amount should go to food expenses alone. Recipients of the certificates of land ownership award (CLOAs) distributed in Catarman, Northern Samar recently pose during photo opportunity with DAR Undersecretary for Field Operations Office Karlo Bello and DAR-8 Regional Director Sheila Enciso. 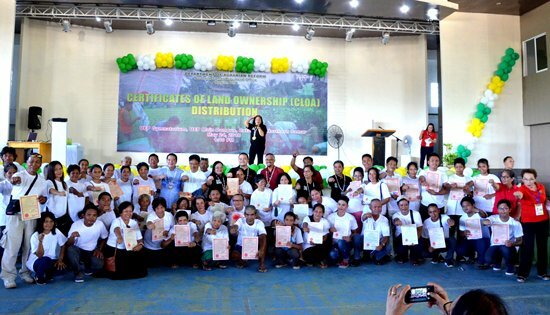 CATARMAN, Northern Samar – Two hundred twenty-six landless famers from three Northern Samar towns turned landowners as they received certificates of landownership award (CLOAs) from the Department of Agrarian Reform (DAR) on May 24. DAR Undersecretary for Field Operations Office Karlo Bello handed the 226 individual CLOAs to the same number of farmer beneficiaries at the University of Eastern Philippines (UEP) gymnatorium. The CLOAs covered an aggregate area of more than 435 hectares of both private and government-owned lands situated in the towns of Catarman, Bobon and Lope de Vega. Bello in his message disclosed that he issued a memorandum directing DAR field offices to review its scope and look for more private and government owned lands that could still be covered under the Comprehensive Agrarian Reform Program’s (CARP’s) land distribution component per instruction from the president. According to Bello, President Duterte is looking into the possibility of extending this program of the government so that more landless farmers could still benefit from it. Meanwhile, Regional Director Atty. Sheila Enciso reminded the CLOA recipients of their obligation to pay the real property tax for they are the landowners now, and to pay the amortization for the beneficiaries of compensable lands. Further, she encouraged the beneficiaries to join agrarian reform beneficiary organization (ARBO) in their area to be able to avail of the various support services extended under CARP. Likewise, Governor Jose Ong, who graced the occasion, assured the agrarian reform beneficiaries (ARBs) of the support from the provincial government for it has also programs for the farmers, he stressed. Due to excitement, couple Joel and Enelita Miano who are both CLOA recipients from Bobon were already at the venue as early as 10 o’clock in the morning though the distribution rite was to start at one o’clock in the afternoon, while Estela Bedeo, 79, thanked DAR for she was able to receive a title to the land she had been tilling for years. According to her, she was happy that they were deprived from paying the processing of the title, but stressed that she will pay the amortization and the real property tax. Dolores Dato, of the Legal Division, explained to the ARBs their rights and obligations as well as prohibited acts emphasizing not to sell their awarded lands within 10 years. QUEZON CITY – The Associated Labor Unions-Trade Union Congress of the Philippines (ALU-TUCP) is demanding that the Bureau of Internal Revenue (BIR) and Department of Finance (DOF) return in cash an estimated P20 billion, including interest, that the Bureau of Internal Revenue (BIR) unlawfully collected from millions of minimum-waged workers for seven months back in 2008. The ALU-TUCP said there is an urgent need to return the workers their money to tide their families in the face of spiraling inflation. In its 56-page January 24, 2017 ruling, the Supreme Court nullified two provisions of BIR Revenue Regulation 10-2008 that disqualify Minimum Waged Earners (MWEs) from tax exemptions on their wage, bonus, and other compensation benefits such overtime pay, hazard pay, holiday pay, and night shift differential pay including fringe benefits in excess of P30,000. The Trade Union Congress of the Philippines (TUCP) filed a challenge before the Supreme Court questioning the BIR regulation and asked for its nullification. The Supreme Court ruled in favor of the TUCP saying that the minimum wage earners (MWEs) should not be taxed because they are exempted from income tax by Republic Act 9502 – the law giving exemption to minimum waged workers from monthly salary tax deduction. R.A 9502 became effective June 17, 2008. However, the BIR issued Revenue Regulation 10-2008 and have collected income tax from workers for 7 months before the agency suspended their collection. Effectively, the BIR continued to collect taxes on the wage, bonuses and other benefits from millions of MWEs from June to December 2008 despite of effectivity of a law exempting minimum-waged workers from such taxes starting July 6, 2008. “Minimum wage earners need these additional cash money which they rightfully own in order to cope with the current incredible rising prices of commodities and surging costs of utilities and services. It’s workers’ blood money. We urge the BIR and DOF to return the money including the legal interests now. Until now, the BIR and DOF have not complied with the high court order for them to make a cash refund,” said ALU national president Michael Mendoza. The ALU-TUCP calls for a cash refund including the annual legal interest the money earned from 2008 to 2017 which ALU-TUCP estimates at P20 billion covering the 10-year period. “We cannot understand why the BIR and the DOF is quick to squeeze money from the workers but it takes forever for them to return what they illegally collected. Mahiya naman kayo! Those are workers’ blood money. Pinaghirapan yan ng mga manggagawa, ibalik na ninyo! said Alan Tanjusay, ALU spokesperson. QUEZON CITY – Students, teachers, and education advocates gathered and held a press conference to discuss the persistent issues and problems in the country’s education system. “Despite the passage of Republic Act 10931 or the Universal Access to Quality Tertiary Education Act, the fundamental problems in the country’s system remain. Thus, the fight for free, accessible, and quality education continues,” said Rise for Education National Convenor Mark Vincent Lim. Rise for Education is a nationwide and multi-sectoral alliance of different student councils and publications from high schools and universities, youth organizations, members of the academe, parents, out-of-school youth, and citizens from all walks of life calling for quality education that is free and accessible to all. “Free education means not a single peso should be collected from students. A ‘no collection policy’ must be in place. However, obtaining funds from students in support of campus press and representation through their duly-elected councils, must continue,” said Kabataan Party-list Deputy Secretary-General Angelica Reyes. “Free education should also be implemented without delays and preconditions. Budgetary support for the immediate roll out of 'free education, no collection' in all public tertiary education institutions should be given without delay. In addition, the Return Service System, embedded in Republic Act 10931’s implementing rules and regulations (IRR) as an additional requirement for free education, must be scrapped, as it undermines the right to education. Instead of ‘forced labor’ disguised as civic obligation, public tertiary schools should democratically create a blueprint to urge and empower students to serve the people and nation,” said Reyes. “Another round of tuition and other school fees hikes is looming. This year, we are expecting that around 400 schools shall have tuition hikes at a rate of 6-10 percent. It is as if this has been the way of private schools in welcoming the youth back to school,” said National Union of Students of the Philippines (NUSP) Deputy Secretary-General Kenji Muramatsu. According to the Union, adding to the burden to the tuition and other schools fees (TOSF) increase is the increase in prices due to the implementation of the Tax Reform for Acceleration and Inclusion (TRAIN) Law. “The TOSF hike is as alarming as how prices went up after the TRAIN Law has been implemented. From their tuition and other school fees, to their necessities in school such as school supplies, books, and food, the added cost of their education makes the burden even heavier. It is indeed a double-whammy towards the students and their parents,” Muramatsu claimed. The student union also lambasted the current administration’s “apparent bias” towards private higher education institutions (HEIs). “CHED and Duterte fail miserably in protecting the rights of students to education. They are even the ones who push students to study in private HEIs, while they allow the non-stop increase in TOSF for the profits of capitalist-educators,” Muramatsu ended. “The K-12 program is the worst neoliberal attack on Philippine education. Since its pilot implementation in year 2015, it has failed in its promise of employability and higher quality of education for the youth. The added two (2) years in basic education guarantee the capitalist-educators more profit from private high schools, and worsen the already substandard school facilities and equipment in public high schools. K-12 legitimizes contractualization among teachers and at the same time creates more mechanisms to breed students into labor exports or additions to the pool of cheap and docile laborers,” said League of Filipino Students (LFS) National Spokesperson Kara Lenina Taggaoa. “As this year marks the first batch of the K-12 graduates, there is no bright future that awaits them. Statistics from Philippine Chamber of Commerce and Industry (PCCI) and Philippine Business for Education (PBEd) have declared that K-12 has failed to train competent employees who are worthy of being hired in companies,” ended Taggaoa. “To uphold the public character of all government-funded tertiary education institutions, a substantial increase in state subsidy must be allotted to support capital improvement, and faculty development necessary to expand operations, and cater more students. Campus facilities and services must be adequate for quality and effective learning and teaching experience,” said Alliance of Concerned Teachers (ACT) Philippines Chairperson Benjamin Valbuena. “Teachers, academic personnel and workers, who have long suffered from low wages, contractualization and high prices of goods, should be given just, decent, and rewarding salaries and benefits,” said Valbuena. “Student councils, campus press, faculty union, and campus sectoral organizations serve a significant role in the pursuit of free education and the advancement of rights and welfare of the Filipino people. Their autonomy must be upheld and they must be free from any form of control and intervention so they can independently pursue principled positions, collaborative programs, and fruitful alliance work,” said College Editors Guild of the Philippines (CEGP) National President Jose Mari Callueng. “Militarization of indigenous peoples’ schools should be stopped and their right to education, ancestral domain, and self-determination should be upheld,” said PASAKA-SMR Chairperson Kerlan Fanagel. “It is high time for the government to backpedal on these policies that have kept millions of Filipinos out of school, and fulfill its constitutional obligation to ensure that quality education is accessible at all levels,” said Lim. “On June 19, education advocates – students, parents, teachers, administrators, personalities, and public officials – will gather at the Rise for Education National Summit in UP Diliman to discuss the updates and prospects of our education campaign and to forge our plan of actions,” said Lim. “Together, we continue the struggle for an education that fosters patriotism and nationalism, and equips the students with the knowledge and skills needed to dedicatedly pursue a truly independent and prosperous Philippines,” ended Lim. Guardian Independent Certification Ltd President Elsa Purificacion and Senior Auditor Jaime Ignacio (2nd and 3rd from left, respectively) hand over the giant ISO 9001:2015 certificate to DAR-8 Regional Director and ISO Champion Atty. Sheila Enciso (3rd from right) while Lead External Auditor Norlito Suelo (extreme left) and DAR Assistant Regional Directors Ma. Fe Malinao and Ismael Aya-ay (2nd from left and extreme left, respectively) look on. 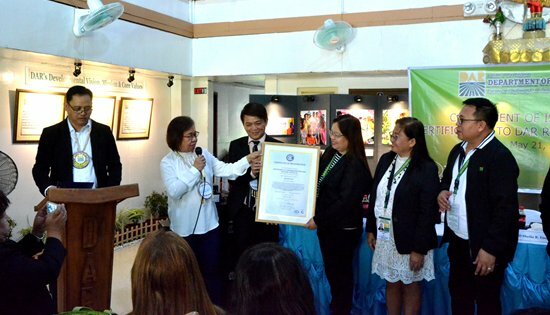 TACLOBAN CITY – The regional office of the Department of Agrarian Reform (DAR) in Eastern Visayas makes history as the first DAR Regional Office in the country conferred with the internationally recognized quality management certification based on ISO 9001:2015 standard. On Monday, May 21, Guardian Independent Certification Ltd President Elsa Purificacion together with Senior Auditor Jaime Ignacio and Lead External Auditor Norlito Suelo handed the giant certificate to DAR-8 Regional Director and ISO champion Atty. Sheila Enciso. The certificate states that this office “has been audited and found to conform to ISO 9001:2015 for the provision of government services (primarily for the agrarian reform beneficiaries and agricultural land owners), undertaking Land Tenure Services, Technical Advisory and Support Services, Agrarian Legal Services and Support to Operations, including technical assistance, administrative supervision and monitoring to DAR Provincial and Municipal Offices in accordance with the Comprehensive Agrarian Reform Program (CARP) as amended by R.A 9700 to all stakeholder of DAR Regional Office-8”. According to Suelo, “this office never cease to amaze me every time I visit here”. He shared that the first time he came here was two years ago, when DAR Central Office conducted the benchmarking and gap analysis, and every time he comes, he sees improvements. In response, Enciso said the journey will not stop with the certification, what we have all to undertake with this quality management system documentation is our commitment to “never ending” continual improvement, specifically service excellence that will reap client satisfaction, while at the same time adhering to statutory and regulatory standards. More than the certificate and recognition that we have received, what is more fulfilling was the change that had happened and has been implemented in our office, she added. Aware of future surveillance audits, Enciso confidently declared “we can tackle them all because the principle of standard has already been implemented in our hearts and mind and is embraced by everyone”. To all DAR Regional Office-8 employees, she urged them not to consider this recognition as the end of what they had been working, but “as a beginning of a more meaningful and promising endeavor for the good and benefit of our stakeholders”. Meanwhile, DAR Central Office’s Agrarian Reform Capacity Development Service Director Susana Serrano disclosed that DAR Regional Office-8 becomes the first DAR regional office to get quality management system certification. The pressure is within you, she added, as you will set the trend for other regional offices who want to be ISO certified. Suelo further shared that this standard started in 1987 in response to global demand for quality products and services. While in the Philippines, he added that then President Gloria Arroyo issued Executive Order 605 directing all government agencies under the executive branch to adopt an ISO 9001 quality management system as part of the implementation of government-wide quality management program in order to promote and enhance public sector performance. QUEZON CITY – The national center of government employees COURAGE today bewailed the present economic plight of government employees and called for a national minimum wage increase of P16,000/month from the current P10,510/month being received by an employee with salary grade 1. Earlier, labor groups in the private sector called for a wage increase citing the inflationary impact of the tax reform law. Based from the Philippine Statistics Authority (PSA) announcement last May 4, 2018, prices of basic goods and services rose to a 5 year high of 4.5% this April higher than the January 2018 figures when the tax reform law was passed and higher than the government’s inflation target range for 2018 of 2-4%. “While we completely support the demand of private sector workers for a national minimum wage hike, we also call on government to give attention to the worsening economic condition of its workers especially lower ranked civilian employees at the local level,” Mr. Ferdinand Gaite COURAGE President said. Gaite cited that the lowest ranked government worker receives lower income of P477.20/day as compared to a minimum wage private sector worker in the National Capital Region who receives an income of P475 - P512 /day. “The situation of local government workers is even worse. An SG1 employee of the local government of Cuenca, Batangas (4th class municipality), for example, receives 358.29/day as compared to a private sector minimum wage earner who receives P317 - 400/day as set by the regional wage board of Calabarzon,” Mr. Gaite added. This, he said, is among the many reasons COURAGE is calling for the implementation of a national minimum wage of P16,000/month for government workers to give justice to lower ranked and local government workers instead of the salary standardization law which shall implement its last tranche of increase next year. “The recent snide remark of NEDA Secretary Ernesto Pernia in a press interview that only organized labor groups will benefit from a national minimum wage increase is uncalled for and only reflects his callousness to the plight of all workers including government workers in his office for whom the progressive realization of the constitutional right to a living wage is his duty to work on,” Mr. Gaite concluded. 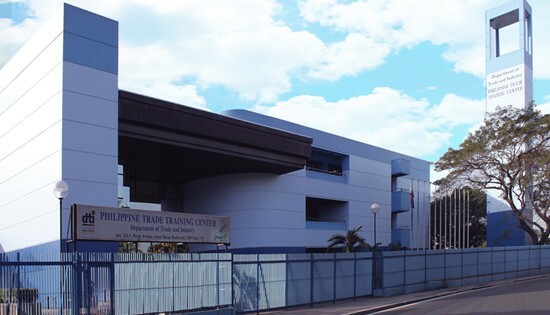 MAKATI CITY – The Philippine Trade Training Center (PTTC) takes a leap as it embraces its new role as the Philippines’ Global MSME Academy, by virtue of a Department Order (DO) issued and signed by Department of Trade and Industry (DTI) Secretary Ramon Lopez on April 18, 2018. Fully dedicated to this commitment, PTTC created Strategic Business Units (SBUs) and customized its programs on three major industries – processed food, services, and consumer goods, and categorized by MSME levels - foundation, intermediate and advanced courses. From the foundation courses on business management, finance and marketing, and production management, each SBU has a focused training pathway with specialized course modules to address expansion in the domestic market and lead MSMEs to gain access to market compliance and internationalization. c. Awareness on the regulatory compliance of Food and Drugs Administration -License to Operate/Certificate of Product Registration (FDA-LTO/CPR), HALAL, and International Food Standards. Water and pH Content and Metal Detector, intended for initial assessment of food properties for third party laboratory testing; and finally, the DigiFab Training Facility for product packaging prototyping, and the Creative Hub which gathers the young creative entrepreneurs to hone their skills and talents.